Nils Allen "Booboo" Stewart Jr. (born January 21, 1994) is an American actor. 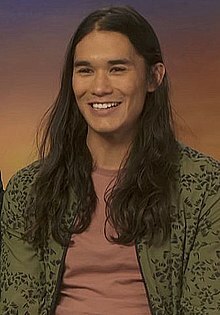 He is known for playing Seth Clearwater, a werewolf in The Twilight Saga, Warpath in X-Men: Days of Future Past, and Jay in the Disney television films Descendants, Descendants 2, and Descendants 3. Nils Allen Stewart Jr. was born in Beverly Hills, California. His father, Nils Allen Stewart, is a professional stuntman. His younger sister, Fivel, is also an actress and recently appeared in the second season of the Netflix original dramedy Atypical. His mother has Japanese, Chinese, and Korean ancestry & his father has Russian, Scottish, and Blackfoot ancestry. Stewart was a former member of T-Squad, a Disney hip-hop/pop group, and performed with his sisters, Fivel and Maegan, as part of "TSC" (The Stewart Clan). During 2006–2010 Stewart appeared or starred in several independent, direct-to-video, or TV films. He also hosted six episodes of the children's show Blue Dolphin Kids in Hawaii, and did stunt work on several films including the 2006 film Zoom and the 2007 film Beowulf. He had roles on episodes of Steve Harvey's Big Time Challenge, ER, Dante's Cove, Everybody Hates Chris and "R.L. Stine's The Haunting Hour". Stewart also toured with Hannah Montana/Miley Cyrus on her Best of Both Worlds Tour featuring the Jonas Brothers and in the Camp Rock Freestyle Jam concert series. He recorded the opening theme for the Disney Channel Games 2008 titled "Let's Go! ", and in 2010 "Under the Sea (from The Little Mermaid)" for the Disney recompilation disc DisneyMania 7. He promoted clothes, as well as toys and games such as Wii Fit and Hot Wheels. He also played Roman in Lab Rats: Elite Force. During 2006–2008, he was a member of the musical group T-Squad. In 2010, Stewart appeared in the movie Logan and portrayed Seth Clearwater in The Twilight Saga: Eclipse, the third installment of The Twilight Saga film series. In 2012, Stewart starred in the movie White Frog as Nick Young, a teen with Asperger's syndrome. In 2013, he played the lead role in Running Deer, an award-winning short film produced and directed by Brent Ryan Green through Toy Gun Films. Stewart also appeared in 2014's X-Men: Days of Future Past acting as Warpath. Stewart starred in the 2015 Disney Channel original movie Descendants as Jay, the son of Jafar. He reprised his role in the 2017 sequel, Descendants 2. Booboo and Fivel Stewart at the Hollywood Premiere of Disney Channel's "Let It Shine" In June 2012. In 2010, he was named a Celebrity Ambassador by the Muscular Dystrophy Association. In his role, Stewart is helping raise awareness in the fight against muscle diseases. He is also part of MDA's "Make a Muscle, Make a Difference" PSA campaign, being featured in print and TV advertisements. He also travelled to Perth, Australia for the Channel 7 Telethon, raising money for the Princess Margaret Hospital for Children. Stewart and his sister Fivel also hosted free concerts on behalf of the national non-profit organization Childhelp. He appeared in a PETA campaign, encouraging people to adopt animals rather than to buy them from pet stores. He is also involved in Four Green Steps, an environmental organization based in Canada. 2005 ER Power Ranger Episode: "Man with No Name"
2010 CSI: Miami Kenny Turner Episode: "Die by the Sword"
Good Luck Charlie Kai Episodes: "Sun Show Part 1", "Sun Show Part 2"
R.L. Stine's The Haunting Hour Kai Episode: "Pool Shark"
2012 Kickin' It Carson Episode: "New Jack City"
2014 Hawaii Five-0 Tommy Fa'aloa Episode: "Ma Lalo o ka 'ili"
2015 Grimm Simon George Episode: "Mishipeshu"
CSI:Cyber Owen Campbell Episode: "URL, Interrupted"
^ Cambio, Team (2010-01-21). "Is Booboo Stewart Ready For Taylor-Lautner Status? Totally. on Cambio". Cambio.com. Retrieved 2012-04-02. ^ "Get to Know X-Men's Booboo Stewart". Audrey Magazine. Archived from the original on 2014-05-23. Retrieved 2014-05-27. ^ Mitchell, Molli (2018-09-11). "Atypical season 2 cast: Who is Fivel Stewart? Who plays Izzie?". Express.co.uk. Retrieved 2018-10-26. ^ "Eclipse's BooBoo Stewart". Audrey Magazine. 2010-07-03. Archived from the original on 2012-03-20. Retrieved 2011-12-12. ^ "Award Winning Oklahoma Short Film Running Deer is Now Available on Vimeo on Demand". News OK. 8 August 2013. Retrieved 8 August 2014. ^ "Twitter / BryanSinger: 3 #Oscars, 6 #GoldenGlobes". Twitter. Retrieved 2014-05-27. ^ Swift, Andy (2016-06-10). "Descendants 2 Premiering in 2017; China Anne McClain Cast as Ursula 2.0". TVLine.com. Retrieved 2016-07-27. ^ "Twilight Star Takes on Role as MDA Spokesman". MDA.org. Muscular Dystrophy Association. July 2010. Archived from the original on June 29, 2015. Retrieved February 24, 2015. ^ "Twilight star Booboo Stewart and sister Fivel perform FREE Concert for Childhelp". Arizonafoothillsmagazine.com. Arizona Foothills Magazine. August 2011. Retrieved February 24, 2015. ^ Tara Kelly, "Booboo Stewart PETA Ad: Twilight Star Says 'Adopt, Don't Buy' Cats And Dogs," The Huffington Post, November 16, 2011. ^ "Reach for the Stars" Archived June 25, 2012, at the Wayback Machine Four Green Steps. Retrieved September 19, 2012. ^ "MARVEL RISING BEGINS! The Next Generation of Marvel Heroes (EXCLUSIVE)". Marvel HQ. December 7, 2017. Retrieved December 7, 2017. ^ '+relative_time(twitters[i].created_at)+' (2012-11-02). "Booboo Stewart Guest Stars on "Kickin' It" & the "Lab Rats" Go to Space This Monday". Clevvertv.com. Archived from the original on 2013-11-03. Retrieved 2014-05-27. Wikimedia Commons has media related to Booboo Stewart.